The Snake Valley Summer Reading Program is about to kick off, with the first session on Tuesday, June 25 at 7 pm (NV) at the Baker Community Center. This is a new program to encourage kids to keep reading throughout the summer to avoid the summer brain drain. We've partnered with White Pine County Library's summer reading program, so young readers (ages 2-10) will receive a free book for participating. Also, the top weekly reader in each age group (ages 2-4, 5-7, and 8-10) will have their name entered in the final raffle prize drawing, to be held August 9 at the Library. Our Tuesday reading programs will consist of story time, with different readers each week, followed by checking out books, a little one-on-one reading time for anyone who would like it, and then playground time. This is going to be a fun reading program! The fifth annual Snake Valley Festival was held this last weekend, and it was a lot of fun. Delicious food, great activities, and terrific community spirit attracted a good-sized crowd. It's great seeing families out enjoying themselves. In addition, thousands of dollars were raised for the Great Basin Water Network (GBWN), which is helping to protect Snake Valley from being dewatered by the SNWA Pipeline project. That money is used to pay attorney's fees as GBWN challenges the Nevada State Engineer's ruling (see more about that here). A huge thanks to everyone who came (it was great to see new faces this year! ), participated, donated, and made this community event such a good time. Check out the Festival page for more photos and the Thank You list. And save June 20-22, 2014 for next year's Festival! Snake Valley Festival Starts Today! The Snake Valley Festival starts today with the delicious ice cream social! Don't miss out on this great summertime treat with time to talk to your neighbors and meet new folks. Special this year is live music from EskDale musicians during the social. Items still needed for the yard sale (drop off between 7-8 am Saturday), the live auction (drop off before 9 am Saturday), the pie sale (drop off by 9 am Saturday) and the bake sale (drop off by 9 am Sunday at the Border Inn). Also, you can still be part of the parade, just line up at 9:45 am Saturday at the Sinclair gas station. Volunteers needed for the Snake Valley Slither on Sunday. Most of all, come and have some fun! See you there! Here's something a little different: the Great Basin quarter. Haven't seen it yet? That's because the grand unveiling will be next week, June 20, at a special event by the U.S. Mint at Great Basin National Park. 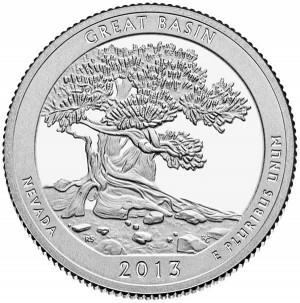 Featured on the quarter is a Great Basin bristlecone, the oldest known single organism in the world (they've been dated to over 5,000 years!). Here's more info. Over the past year, the kids at Garrison Elementary School have been working on their Junior Paleontologist badge from the National Park Service. (You can download the book here.) This is a free program, but it takes a bit of work. So about every month, the kids did different activities from the booklet and learned about how fossils are made, what paleontologists do and what kind of tools they use, different creatures that lived in different times, and more. For one activity, they made fake fossils by creating impressions in some home-made playdough. They had a chance to be creative and decide what they would make. For the last session, a real paleontologist came to the class. He did a great explanation of geologic time by having the kids envisioning that the room was filling with water. As he raised his hand to show where the water was, the kids raised their hands. The water kept getting deeper and deeper as the earth aged, but even at the height above their heads, there were no fossils. The fossil record didn't start until just a couple feet from the ceiling. Now that's a different time scale! Once we got into the fossil record, Gorden had some fossils to show, and the kids loved taking a look. Then came the fun part: all the kids received their Junior Paleontologist badges, complete with a dinosaur on it. Most national park units have their own Junior Ranger program, but this is one that is nationwide and can be done anywhere. We have great paleontological resources in Snake Valley, and now the kids know a little more about what used to live here and how it has been preserved. On the last week of school, Teresa Conrad brought her EskDale physics class to Great Basin National Park. They looked at differences in water quality and streamflow between a spring and a stream. Then the real fun began: electrofishing. First Mark and Jon got out the multimeter to explain how the electrofisher worked. Then it was time for the students to get in the stream and take their turn capturing fish that were stunned by the electrical shock. They learned about proper net placement. They caught quite a few fish! I don't think any of them guessed there were that many fish in a 50 m stretch of stream. It was a perfect activity for the end of the school year, with great weather.